Hello,I have been selling with eBay from Japan so I can provide you the best service..
Contax TLA 360 Camera Flash. Condition is Used. Shipped with USPS Priority Mail. Tested and everything seem to work properly. Contax Real Time Flash 540 + RTF Power Pack vintage RARE ! Great condition! Also includes 2 cables to attach to flash. Everything looks to be overall in good physical condition for its age, but no idea on functionality of everything. The Double A battery section looks to be in great shape though. Includes everything in the pictures. CONTAX TLA 360 Shoe Mount Flash w/ Case for 645,N1,NX - US Seller FAST SHIPPING! Performance: It works good. It has been fully tested by my tech guys. I guaranty that it will arrive as described or your money back. Problem is that it has mount broken. Look at the pictures. There are minor marks in the matte black finish if the housing. Two flash tubes are employed to facilitate easy flash fill photography. The second, smaller flash tube, located on the front below the main flash tube, is switchable for on/off. The power zoom feature allows 6 different coverage angles based upon focal length selected from 24mm to 85mm. Mount : Shoe. Bounce Head : Yes. Swivel Head : Yes. Made in Japan. Shoe Mount. ELECTRONIC TAL-20. My first priority is getting the item to you in good condition. Flash is in good condition. Little signs of wear on flash or case. LOC# BAS013ESM. FOR THEM AND WE DO NOT KNOW HOW MUCH THEY WILL BE. WE WANT YOU TO BE HAPPY. NO ACCESSORIES. YOU ARE RESPONSIBLE. Trending at $24.51eBay determines this price through a machine learned model of the product's sale prices within the last 90 days. 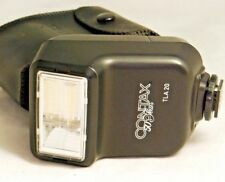 Contax TLA 20 Flash Unit is designed to be used with the Contax 139 Quartz and Contax 137 MD Quartz. Sears Contax 50 Year aniversary TLA 20 Flash (5226030) Used. It has been used but is in good condition. It shows light wear on exterior. But no noticeable dents, cracks or any broken parts. No other accessories will be. Flash has been used but looks good. It shows normal wear on the body. But it is badly csratched. Mostly around the edges. Appearance of the item. Original Case. Appearance of the item. No scratch. This item is very clean. Product we have checked all. G rade:Near Mint. US 49.99 for 1 lb. I participate from Japan. So I can provide you the best service. The body is keeping beautiful state. [Near MINT] Condition. Near Mint Minimal signs of use. ■Appearance. Appearance is very beautiful. Flash has been used but looks good. It shows light wear on the body. No other accessories will be. I don't see any scratches. All pictures of the actual item for sale. policies for more info. Good luck.